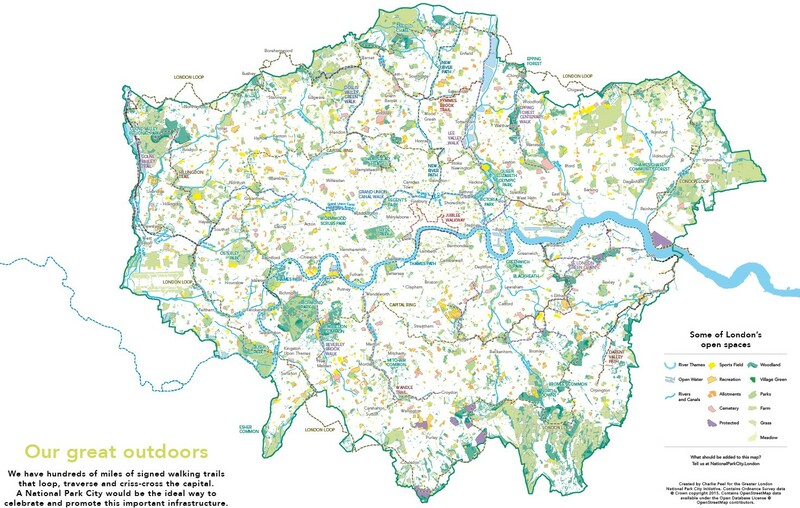 Apparently everyone wants London to become a National Park City. 85% of Londoners think it’s a good idea, 203 of London’s wards have declared their support, and hundreds of community groups, businesses, charities and environmental organisations are keen. Not only was it one of Sadiq Khan’s election pledges as Mayor of London, it was an election pledge also made by most of his rivals. In fact, all this support might explain why it hasn’t made the headlines and TV breakfast shows it should have – perhaps editors find it a bit boring when everyone agrees on something. But what exactly is a National Park City? Last night I went to the Southbank to hear it explained by a collection of the environmentalists, GPs, firefighters, therapists, economists, sewage experts, CEOs, conservationists, photographers, poets, geographers, architects, philanthropists and primary school beekeepers. 1 in 7 species in the UK are at risk of extinction. 1 in 7 children in London haven’t visited a natural place to play in the last year. The link seems obvious. On top of the damage that environmental isolation has on children’s mental and physical health, Raven-Ellison points out that this detachment also crushes the likelihood of young people wanting to protect nature and green spaces later on in life. But despite these depressing statistics, London isn’t the ecological wasteland you might expect. In this mosaic of habitats more than 13,000 species of wildlife survive, among them peregrine falcons, fastest animals on our entire planet, carnivores able to annihilate pigeons at speeds of over 200mph. That said, London’s urban ecology faces pressures like never before. The country has a national extinction crisis on its hands, with 60% of species declining. Increasing numbers of households are paving over their front gardens and sterilising their back gardens with plastic astroturf. Meanwhile, London’s population is expected to increase by another fifth, reaching 11 million residents by 2050. All this, and the National Park City initiative remains optimistic. Bucking environmental preconceptions, they don’t see a conflict between human settlement and wildlife habitat. Not only do they want to protect what we’ve already got, they want to increase London’s green spaces from 47% of the total area to over 50%, while ensuring that every single Londoner is secured free and easy access to these spaces. They hope to learn lessons from cities like Singapore and Vancouver, whose waters are clean enough to support families of otters. Perhaps most exciting of all, the National Park City people imagine rivers that are safe for humans to swim in. There is no shortage of “selfish” benefits that come with wilder, greener city spaces. Study after study highlights the positive effect of nature-based activities on mental health. And then there’s the obvious bodily benefits. And then there’s the countless, immeasurable benefits of community cohesion and democratic interaction. And then there’s the exciting potential for re-localised food systems. All of this of course, underpinned by the broader ethos of reducing our ecological footprint, as individuals and as a city, and in turn preserving the breathing atmosphere in which any imaginable benefit depends upon. This all sounds great, but who’s going to pay for it? Once established, the Greater London National Park City Partnership is asking for around £4 million a year to run. While this might sound like a lot, the initiative is quick to point out that £4 million is about how much it costs to run a medium-sized secondary school. It’s also about the same amount that rural National Parks already get. Considering the trailing list of benefits, this works out as around 46p per London resident. Back in the Royal Festival Hall, suspicion of corporate sponsorship hits a few nerves in the audience of Londoners. Heckling from the back of the auditorium, someone starts waving a laminated sign and shouting about the Garden Bridge – a controversial project also promoting a greener London, though entirely separate to the National Park City initiative and dramatically less popular. The audience – a substantial part of it anyway – erupts in applause and cheery woops. In many ways, the National Park City proposal can be seen as the grassroots alternative to the Garden Bridge. On the one hand, we have a £185 million proposal for a 367 metre pedestrian bridge, imagined by a famous actress who, speaking to the BBC in 2013, boasted to have known the then Mayor of London Boris Johnson since he was four years old, making him “largely quite amenable” to the project. On the other hand, we have a proposal asking for just 1-3% of the cost of a Garden Bridge, which promises to steer thousands of organisations and individuals that it has already united towards benefiting a city of 8.7 million people.